Make your meetings more mindful with Work From Om® at OFFSITE. New York's most innovative corporate meetings and events space has teamed up with the city's most trusted provider of workplace meditation, yoga and mindfulness training to bring guests a full array of guided classes, engaging workshops and custom experiences designed specifically for a workplace setting. Make your meetings more mindful with Work From Om® at OFFSITE. 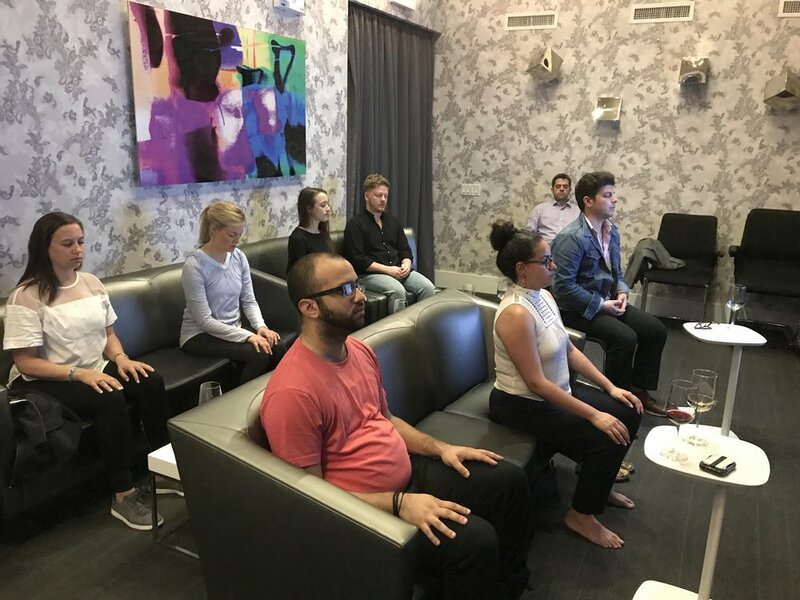 New York's most innovative corporate meetings and events space has teamed up with the city's most trusted provider of workplace meditation, yoga and mindfulness training to bring guests a full array of guided classes, engaging workshops and custom experiences designed specifically for a workplace setting. Work From Om® has served 100+ companies in the NYC area, providing mindful stress management, meditation and yoga programs designed to enrich workplace wellness and culture. Your group will love our sessions! Scroll down for an overview of available offerings, then use the the inquiry button below to get in touch. We'll work directly with your OFFSITE meeting coordinators to ensure you get the experience you know and love. What offering(s) are you interested in? Subscribe to the Work From Om® Newsletter? You'll receive special offers, exclusive invitations to special events, wellness tips and musings. We respect your privacy. Thanks for getting in touch! Someone will contact you shortly. Move with ease, clear your head and find your flow with this office-friendly program designed to stretch the body and the mind. The session begins with a simple but powerful sequence of chair-yoga and standing stretching to bring awareness and relief to the physical effects of tension and stress. Then, participants are led through a breath-based mindfulness meditation for a sense of clarity and calm. No mats, no change of clothing, no sweat! Mental clarity, reduced stress and improved decision-making are just a few of the many benefits of regular meditation. Work From Om® meditation programs are designed for a workplace setting and provide a foundation on which participants can build a personal practice. Our certified and experienced teachers make meditation approachable, accessible and enjoyable and leave time for Q&A following every session. Say hello to aha!-moments with our high-value workshops, which are as educational as they are experiential. From breath awareness to ergonomics to digital diets, we'll teach your team how to be healthier, happier and higher functioning just by bringing a little om to the office. Each workshop includes a presentation, discussion, guided practice and takeaway handouts, making them a great addition to workplace wellness initiatives, training and development programs and corporate meetings and events! Click here to check out our workshop offerings (new window will open) or let us customize one just for you. Work From Om®’s yoga classes are designed to provide a friendly, encouraging and supportive space to learn, grow and enjoy the many benefits of yoga. Emphasizing breathing, body awareness and alignment, our sessions prepare beginners to start their yoga journey while enabling attendees with prior experience to challenge themselves appropriately. Through yoga, Work From Om® aims to help individuals cultivate balance, flexibility, strength, patience, compassion and courage where it is needed, and companies to enrich workplace wellness and culture. Let Work From Om® add a sanctuary to your OFFSITE meeting with our popup Zen Den, where guests can retreat for some guided exploration in mindfulness, meditation and movement. Visitors can sit back and relax in the cozy meditation corner, play with our favorite yoga props at the stretching station, or enjoy a healthy snack (or glass of wine, perhaps!) 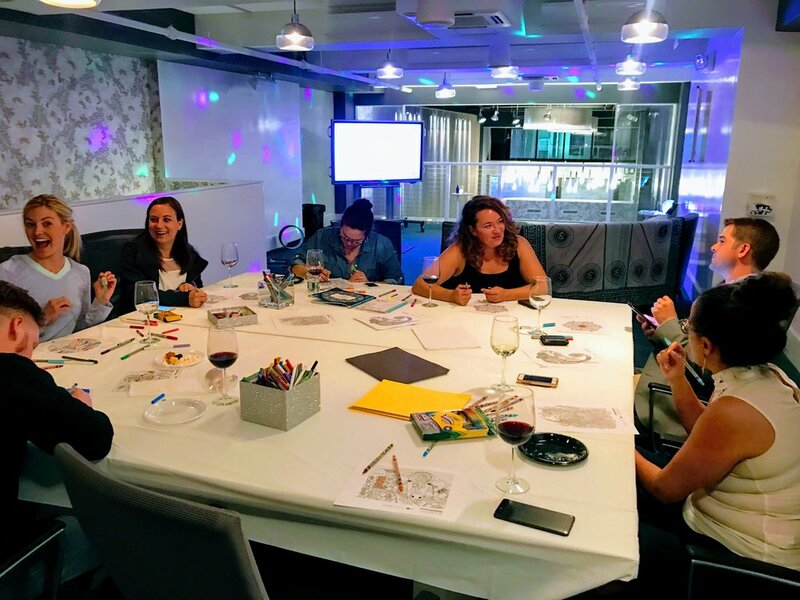 while channel their artistic side at our mindful coloring station. Work From Om® teachers will be on hand to facilitate, hold space, assist and answer questions. Look no further than Work From Om® to build the perfect wellness component for your OFFSITE meeting or event. Let us design a workshop for a mindful approach to your group's unique challenges, or feel-good programing to give thanks and reward your hard-working team. Whether you need a one-hour session or a full day agenda, you can count on us for a quality, tailor-made experience that your guests won't soon forget.